The solution is simple to save the Scans as JPEG files in WinScan2PDF at the Version 3.09! 1.) ... Save the PDF pages as JPG or PNG! 2.) ... The last storage location will be saved in version 3.88 in the ini! 1.) Save the PDF pages as JPG or PNG! Save as JPEG image to save the selected Scan as an JPEG file, or Save all as JPEG-images to save all scanned documents to JPEG files. (Image-1) Saved the Scans as JPEG files! 2.) The last storage location will be saved in version 3.88 in the ini! The most recently used directory for saving the PDFs and images is stored in the ini. 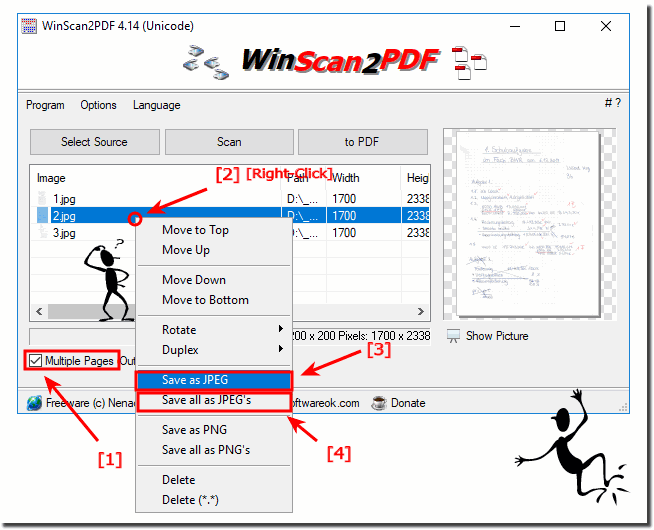 WinScan2PDF - FAQ-7: Save the Scans as JPEG files in WinScan2PDF, how to?